Parents need to synchronize the care for their offspring. This leads to extreme and unexpected diversity in how parents attend their nest in shorebirds, finds an international team led by Max Planck researchers. Some pairs switched duties 20 times a day, while in others one parent sat on the nest for up to 50 hours. The key factor underlying this variation is risk of predation, not risk of starvation. Surprisingly, the rhythm of nest attendance often did not follow the 24-h day. In birds, like in humans, investment in offspring is often provided by both parents. Thereby, individuals have to synchronize their activities with those of their partner. Behavioural rhythms that arise from such social synchronization have barely been studied, especially in free-living populations. 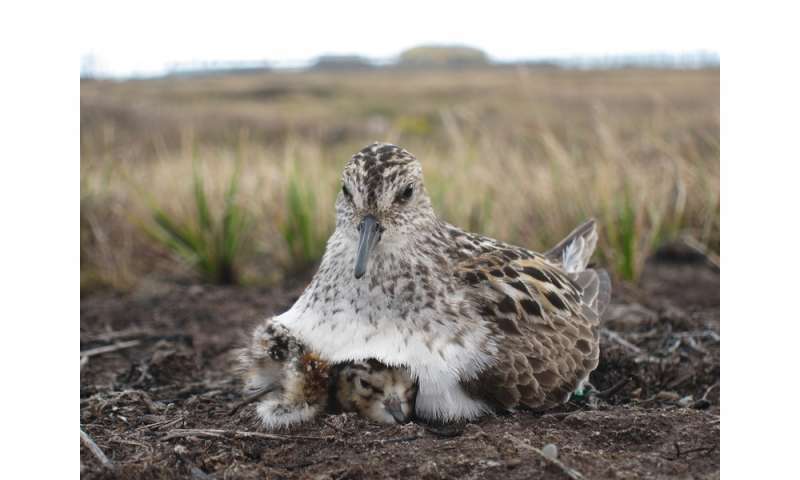 Now, an international group of 76 researchers studying shorebirds teamed up to investigate how parents divide the time they sit on the nest while incubating their eggs. This is a particularly sensitive phase of social synchronization because eggs cannot be left alone for long: they may get eaten by predators, or embryo development may be impaired due to cooling or overheating. 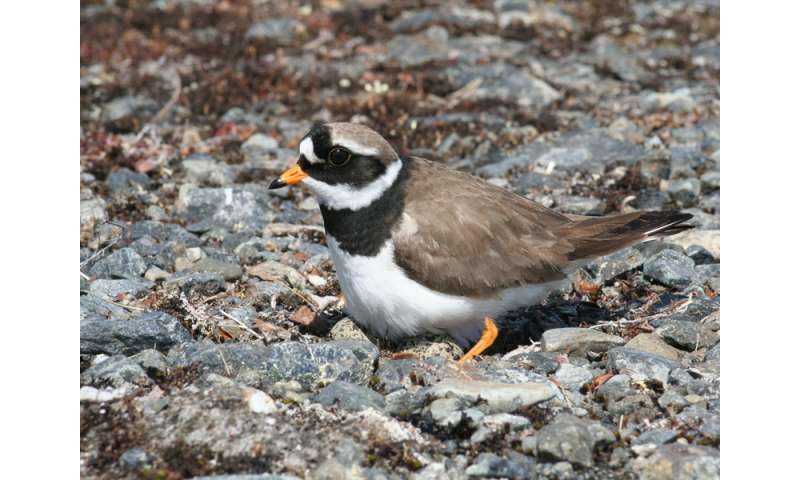 Headed by Bart Kempenaers and his doctoral student Martin Bulla of the Max Planck Institute for Ornithology, the team assembled data from 729 nests of 91 populations of biparentally incubating shorebirds in a variety of different breeding locations. Incubation was monitored in a variety of locations using automated systems. The large scale of the study was also made possible because "We realized that many shorebird researchers were collecting relevant data without even planning to", says Martin Bulla, first author of the study. Scientists were using light-logger data to determine the birds' migratory routes. The loggers are attached to the legs and continuously record light intensity. When the bird is sitting on the nest, its legs are underneath the body, and the light-logger records darkness. "So, we could use this to infer incubation, even for pairs that were not locally monitored". The researchers found a remarkable diversity in incubation patterns within and between species, even when pairs bred in the same area. Some pairs switched incubation duties almost every hour, whereas in others one parent sat on the nest for 24 hours and sometimes even 50 hours. The duration of these incubation bouts was unrelated to energetic demands, but depended on the risk of predation: species readily visible had shorter incubation sessions than the ones relying on parental crypsis. The cryptic species probably benefit from fewer change-overs at the nest, because these are the only times when there is activity close to the nest which might reveal its location to potential predators. The rhythms that emerged from these incubation sessions also differed substantially. The 24h day-night cycle is the typical driver (Zeitgeber) of behavioural rhythms. However, during the summer months when most shorebirds breed, the 24-hour light-dark conditions disappear at higher latitudes, with continuous polar daylight in the Arctic. Although animals are known to use more subtle Zeitgebers such as light quality or temperature, the researchers found that incubation patterns became indeed more variable and were less likely to follow a 24h rhythm with increasing latitude. Surprisingly, incubation rhythms that defied the 24-hour day were also found at lower latitudes with dark nights. Because many shorebirds use tidal habitats for foraging, the researchers also tested the hypothesis that incubation patterns in such species follow a tidal rhythm, but this was not the case. Ultimately, the incubation rhythms are determined by how the two parents coordinate their duties. Parental "decisions" might be related to how their internal clocks synchronize with each other. 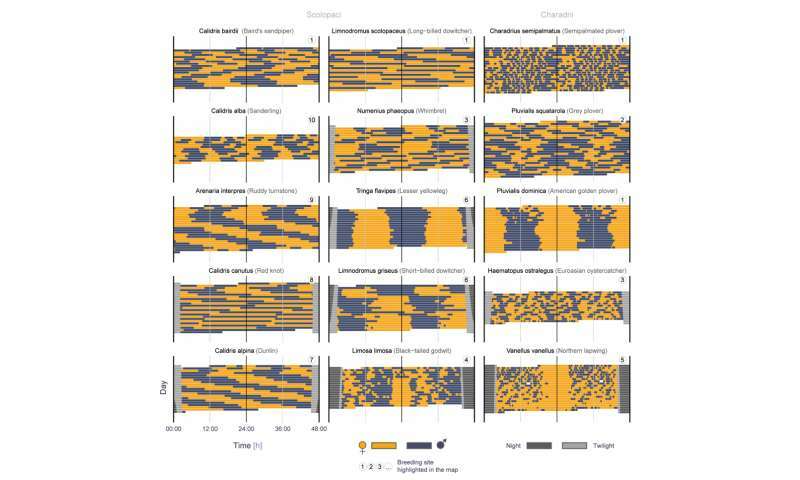 "It might sound trivial", says Bart Kempenaers, senior author of the study and director at the Seewiesen institute, "but given that two individuals are involved, each with their own rhythm, synchronization might lead to different outcomes for different pairs". But how does this synchronization work? Is one partner imposing its rhythm on the other, or are pairs negotiating and finding a compromise? Perhaps human parents know the answer.